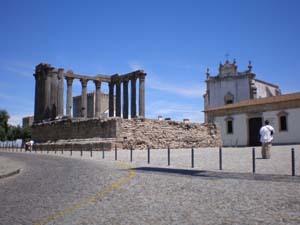 The 3rd century Temple of Diana in the interesting city of Evora, the Alentejo, Portugal. This small city also boasts a beautiful 16th century acquaduct and a chapel built entirely of bones. One of our favorite hotels is also located right next to the temple. The Pousada (as state-run hotels located in historic landmarks are called) is in a former monastery. Rooms are called ‘cells’ but they are hardly monastic. Rather, they are luxurious and with all of the comforts you would expect from a fine hotel. We longed to dive into the sparkling pool but duty called.